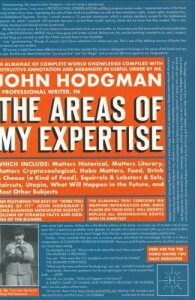 The Areas of My Expertise, John Hodgman, Riverhead Trade, 2006, ISBN 978-1594482229, 256pp. I acquired this book through our book club gift exchange and, although I had never heard of it before, thought it would be an interesting read, and it came recommended by some of the members of the club. I tended to read it before going to sleep every night, and perhaps that affected my opinion of it, but in comparison to the other book I was currently reading, the latest novel by Joe Keenan, its humor felt to me either so understated as to be missing or so forced as to be strained. The list of 700 hobos was probably the best “bit” in the book, and it suffered from what I term Saturday Night Live Syndrome 1: that is, not knowing when or how to end a skit. (For the record, SNL Syndrome 2 is having the people in every skit talk to the camera, typically as if they were on a cable TV talk show. Both of these are more true of 1990s-2000s SNL than the original years. Today’s SNL would have John Belushi as the host of a cable TV show called Samurai Fill-in-the-Blank every week. But I digress.) Some would say that the very excess of the hobo names are what makes it humorous, and maybe it’s better in the audiobook version, but simply reading the names ad nauseum was more soporific than tickling. 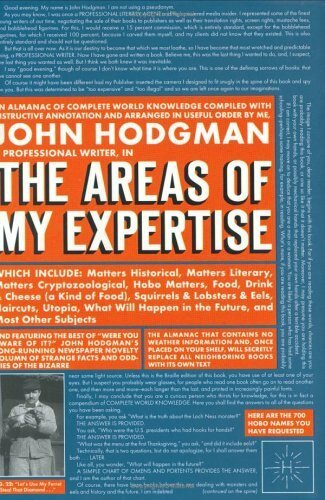 What I did find amusing, however, was the “voice” of the book, as Hodgman chose to be the ultimate voice of authority, but for some parallel world in which only he lives. Like Borges’s classic short story, “Tlon Uqbar Orbis Tertius,” some of what Hodgman describes here is verging so close to the truth, but not quite there, that it doesn’t seem too hard to believe, and thus make real. Hodgman seems an ambitious enough humorist, and while I didn’t care for this book so much, I’d be willing to give him another try in the future.